The formal garden of Augustusburg Palace in Brühl has been inscribed on the UNESCO World Heritage List back in 1984 together with the Brühl Palaces and counts as an outstanding example of internationally renowned garden art. The magic interplay of French-style gardens with the palaces made them a prime example for numerous 18th century German courts. Beginning in 1728, the Baroque gardens were created by Dominique Girard, probably a student of André Le Nôtre, the master gardener in Versailles. 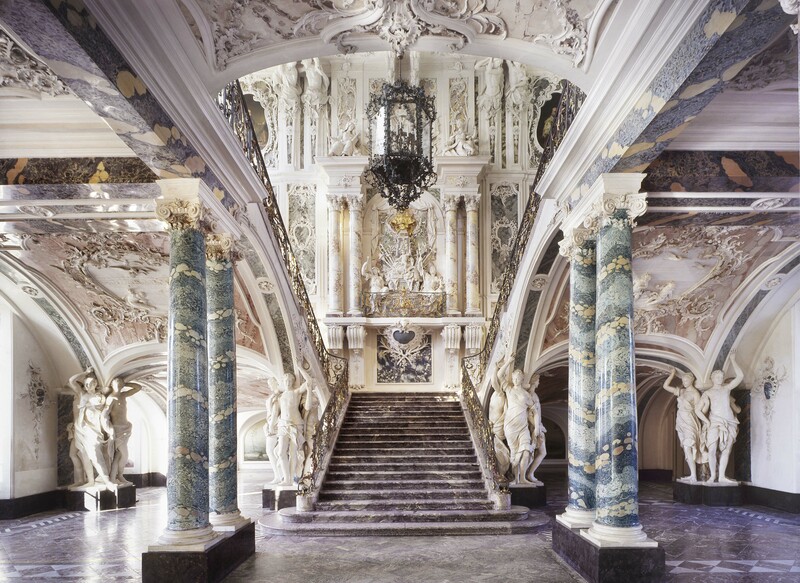 He created a landscape after the French paradigm of fashion, incorporating his experiences of his prior garden creations at Nymphenburg, Schleißheim as well as the Upper Belvedere in Vienna. Centrepiece of the gardens is an ornamental parterre with round and quatrefoil fountain basins. The delicate ornamental boxwood flower beds with their almost filigree character are interspersed with patches of grass and coloured gravel. They are framed by borders, planted with summer blooms that flower from May to October in a strict rhythm of colour and vision. An adjacent mirror pool is fed by a final jet of water by way of flat cascades. Lateral alleys of lime tree lead over to the bosquets, small formal plantations of trees including open rooms and fountains. Since 1842 the garden designer Peter Joseph Lenné redesigned the gardens and park following the fashionable English landscaping designs. This transformation commissioned by the Prussian king Frederick William IV determines the forested park grounds still today: woodland changes with meadows crossed by flexuous walks and waters. A technical sensation of its times, Lenné even planned the recently opened railway track from Cologne to Bonn back in 1844 to lead across the water pools via a richly decorated iron rail bridge. The Baroque “Garden Parterre” follows an extensive expert restoration during the years of 1933 – 1937 and, today, it represents one of the foremost examples of an 18th century European formal garden.